A man and his son clear the rubbles from their house after it was damaged by an earthquake in Behsud district of Nangarhar Province, Afghanistan, Oct. 27, 2015. Rescuers are working to reach remote areas of Pakistan and Afghanistan rocked by Monday's 7.5 magnitude earthquake that has killed more than 360 people and injured more than 2,200 others in both countries. The quake struck northern Afghanistan's sparsely populated Badakhshan province, but the toll is the worst in Pakistan's northwestern Khyber Pakhtunkhwa province, where officials have confirmed at least 202 people killed and more than 1,486 injured. While traveling through some of the badly-hit areas Tuesday, VOA witnessed military-led rescue teams busy evacuating injured people and bringing emergency aid to victims in remote mountainous districts, including Dir and Timargarah as well as the semiautonomous tribal district of Bajaur on the Afghan border. Bajour, a former militant heartland, borders Afghanistan’s northeastern province of Kunar which was also affected by Monday’s earthquake. Pakistani Prime Minister Nawaz Sharif held a meeting of high-level officials to hear reports on the damage and said his government will make every effort to help those affected. Sharif said Pakistan will announce a relief package once authorities carry out a comprehensive assessment. 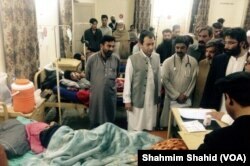 Khyber Pakhtunkhwa Minister for Education Muhammad Atif Khan inquires about injured patients at the DHQ hospital in Mardan, Pakistan, Oct. 27, 2015. 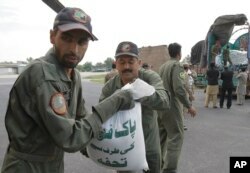 Pakistan's military and civilian aid agencies continued their aid effort Tuesday by sending helicopters, tents, blankets and food to areas hit by the earthquake. VOA reporters in South Asia are in contact with officials in Afghanistan and Pakistan to determine the number of casualties in Monday's 7.5-magnitude earthquake. The following is a list of confirmed deaths and injuries. The list will be updated as more information is obtained. In Afghanistan, President Ashraf Ghani tweeted Tuesday that the death toll in his country had risen to 115 killed with 538 others injured in nine provinces. The deaths in Afghanistan include 12 schoolgirls who were killed in a stampede as they rushed out of shaking buildings in Takhar province. Aid officials say getting assistance to all of the quake stricken areas will take time. "Till now, we don’t have difficulties but access (in) geographical areas in Afghanistan is difficult. It takes time. It is not easy to just get in. It takes time to move. Roads are not open. Security is a problem. These are the causes," said Abdulrahman Kalantary, the disaster management director for the Afghan Red Crescent Society. "Security is a problem overall. When you want to deliver assistance or deploy teams in an insecure area you have to make sure you establish contacts with armed groups, make sure that there are not landmines or military operations on the ground. We’re trying. Right now, in some areas, we are operating in unsecure areas," Kalantary told VOA. The Taliban issued a statement urging aid agencies to "not hold back" in their work and ordering the group's fighters to "lend their complete help" to victims. The U.S. has yet to receive a formal request for aid, but is “certainly willing to consider any such request should there be one," State Department spokesman John Kirby said Monday. "We stand ready, as always, to provide assistance at this difficult time." The massive earthquake also triggered landslides in mountainous northern and northwestern Pakistan. The army said rubble blocked the road in multiple places along the Karakoram Highway (KKH), the only road link between Pakistan and China, and that work continued Tuesday to clear the way. The U.S. Geological Survey registered two tremors with magnitudes of 4.7 and 4.8 in the same region within 90 minutes of the major quake. Pakistani soldiers load relief goods to a plane for earthquake victims, in Peshawar, Pakistan, Oct. 27, 2015. Reports say buildings also swayed in the Indian capital, New Delhi, forcing office workers out into the streets. The earthquake comes nearly six months after a devastating quake in Nepal killed thousands of people and destroyed hundreds of thousands of homes. In October 2005, a quake with a magnitude of 7.6 in Pakistani-held Kashmir also devastated northern Pakistan, killing more than 80,000 people across Kashmir, Afghanistan and Pakistan. For updates on this breaking story, follow on Twitter VOA reporters Ayesha Tanzeem in Kabul and Ayaz Gul in Islamabad. Smita Nordwall and Chris Hannas contributed to this report from Washington.